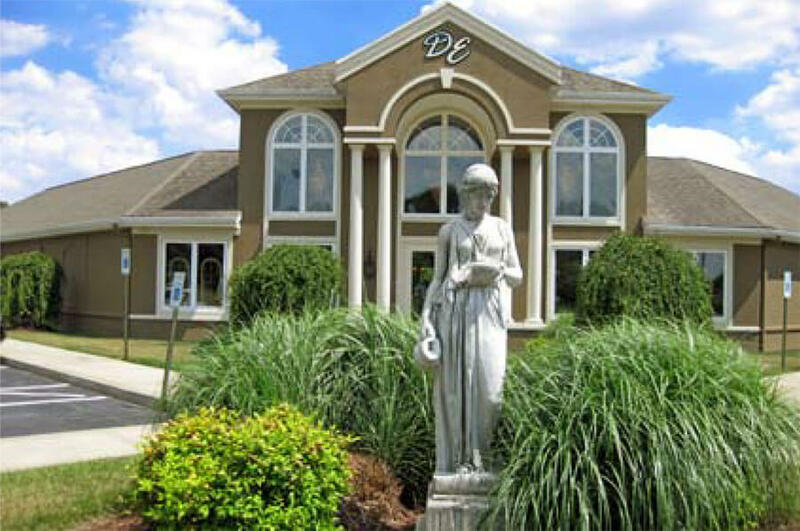 Designer’s Edge Hair Studio & Bella Vita Garden Spa is a European-style luxury spa and salon located just minutes from Ocean City, Maryland. Designer’s Edge provides the ultimate spa experience to an upscale audience, including advanced hair styling, massage treatments, nail care, and even a signature boutique and outdoor Tuscan-style café. For the staff at the Designer’s Edge, style and elegance are everything, from the ornately columned grand entrance to their specially formulated Designer’s Edge hair-care and skin-care products, and everything in between. So when the company added an employee lounge with the same opulence and style as the rest of the facility, they wanted a floor treatment that would create a refined, sophisticated look that could stand up to the salon’s chemical residues and heavy foot traffic with minimal maintenance. And because of a tight construction schedule, they wanted it as quickly as possible. 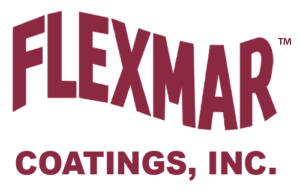 David Ingersoll, owner of ORGanization Creations, had the perfect product for the job: Variegate™ stain sealer, a brand new polyaspartic treatment formulated by Flexmar Coatings. 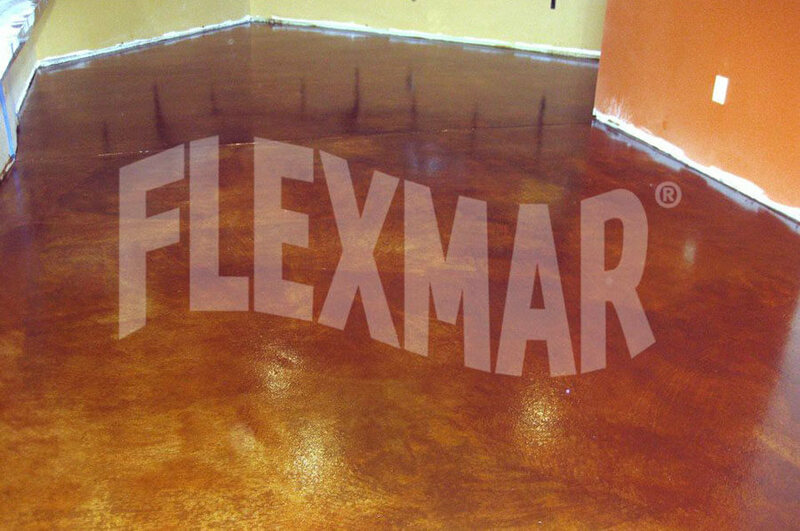 Variegate stain sealer was chosen because it would provide a protective barrier with durability and adhesion to concrete that is far superior to that of epoxies, acrylics, and acid stains. What’s more, Variegate achieves a natural, acid-stained look in just hours. First, the application crew repaired concrete surface defects and sealed any cracks. Then they used a diamond grinder to prepare the concrete surface to receive the polyaspartic stain sealer. Second, a base coat of the Saddle Brown Variegate stain sealer was applied directly to the concrete. One installer used a brush to cut in the base coat along the concrete floor edges and into expansion joints, while the other followed behind and rolled the base coat onto the remainder of the concrete, leaving no exposed areas of the floor. After less than an hour drying time, the base coat was ready for the next step. Third, a second coat of the Saddle Brown Variegate stain sealer was applied over the base coat. But instead of applying a tight coat using rollers and paint brushes, the crew used a nylon-bristled brush to swirl the second coat on top of the first coat, enhancing the variegation effect. Again, after less than an hour’s drying time, the second coat was ready for the last step. Fourth, the final coat, a Flexmar clear polyaspartic sealer with a slip-reduction agent additive was applied. This coat was tight-cut and rolled on top of the Variegate stain sealer to provide a higher gloss to the floor and “pop” the color. After about an hour, the Flexmar clear sealer was dry, and the floor was ready to be returned to service. 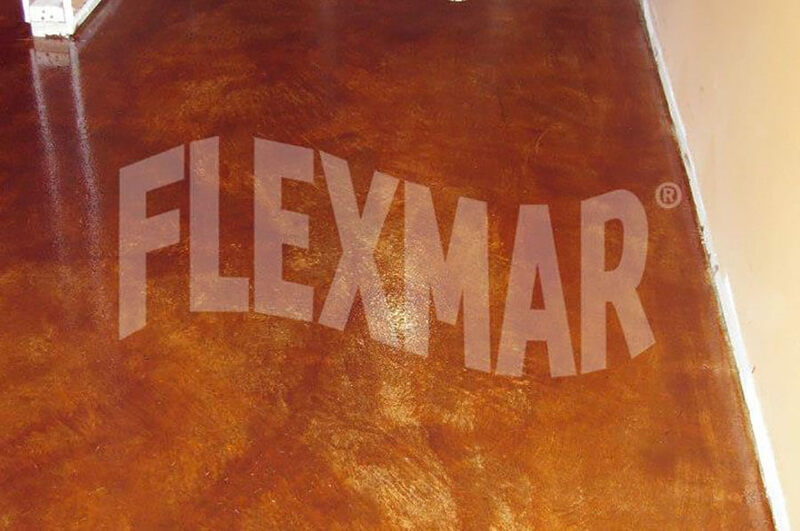 Flexmar Variegate polyaspartic stain sealer provides a tough, hard finish that can last up to ten times longer than other concrete stains and acrylic sealers. It resists damage from chemicals and mild acids, wear and abrasion, chips, and stains because polyaspartic coatings and sealers create a virtually impenetrable surface when properly applied to concrete. But for being such a durable coating, the Variegate look is hardly rugged—Variegate polyaspartic stain sealer beautifully simulates an acid stained look without the need for acid staining. The combination of a semi-transparent stain and a clear polyaspartic sealer allows for rich colors to “pop” from a glossy glass-like surface. And since polyaspartic coatings and sealers won’t fade or discolor when exposed to UV light, the bold, rich Saddle Brown color will look like new for years to come. With a quick cure rate, the Variegate application was completed in just hours with no disruption to the normal operations of the business. And there were no unpleasant odors in the rest of the facility, even though work was completed during normal business hours. For ORGanization creations, the quick installation made all the difference. “If we had a product that would have taken a week [to install], we wouldn’t have gotten the job,” said David Ingersoll.